Phuhlisani is a lean non-profit company with four directors, one member of staff and a network of local and international associates. We summarise our work over the last three years below. Farm workers have historically been one of the most marginalised and vulnerable worker groups in South Africa. As a whole the agriculture sector in South Africa contracted significantly following deregulation in the 1990s. Subsequent agricultural policies which stripped away state subsidies and support as part of a voluntary structural adjustment programme had the effect of intensifying concentration throughout the industry while undermining the potential for the emergence of a small holder producers. These policies and process have impacted on the nature of work in the sector with the result that many agricultural workers lost permanent jobs to become seasonal or casual labourers who now live off-farm. Research and strategy development for improved farm worker housing, access to services and tenure security in the Cape Winelands District. Research for Laborie Initiative which brings together employer bodies and unions in search of improved conditions in the fruit and wine sectors. Social Dialogue for Decent Work in Agriculture in association with Ethical Trade Institute and the Labour and Enterprise Research Group at UCT. Phuhlisani has undertaken work for the Land Rights Management Facility. Over the past two years we have provided support to resolve land rights management issues in rural and urban settings. This work has included clarification of land rights in former 'coloured reserves' where rights are regulated in terms of the Transformation of Certain Rural Areas Act (TRANCRAA). We have also provided support for the settlement of the complex Ebenhaeser Restitution Claim and the revitalisation of the Communal Property Association established by the ‡Khomani San. ​In 2017, in association with the Land Portal members of this network have prepared a South African country profile, a listing of organisations working in the land sector and collected a range of open access land related resources which are now available online. Network members make submissions on land, planning and tenure reform legislation. We are currently seeking funding for programme to pilot local land recordal systems in different 'communal tenure' settings. This process has also involved providing logistical support to community representatives to attend public hearings on different laws and the Motlanthe enquiry into the efficacy of post 1994 land legislation and the impacts on local people's lives. A Phuhlisani team has been in close collaboration with Bertha Foundation staff to support a process for restructuring the Boschendal Treasury Trust (BTT) and planning for the development of agricultural land held by the Trust. Community Development Forums have been established in each of 5 villages in the Valley - Kylemore, Johannesdal, Pniel, Lanquedoc and Meerlust Bosbou. Initial sessions have been held with new trustees on all components. An agriculture plan has been finalised and accepted by the Trustees; finance has been obtained; management support services have been identified and the first phase of the plan is operational. Elsewhere at Sanddraai and Matsoba Phuhlisani is involved in the design of joint venture processes which seek to deliver tangible benefits to workers. programmes supported by the Ford Foundation’s Office for Southern Africa (1) Expanding Livelihoods Opportunities for Poor Households Initiative (ELOPHI) - an initiative focusing primarily on South Africa and Mozambique (2) Building Economic Security over a Lifetime (BESOL) designed to build up the long term economic stability of very poor households in both urban and rural areas with the primary goal of reducing vulnerability and building up assets. 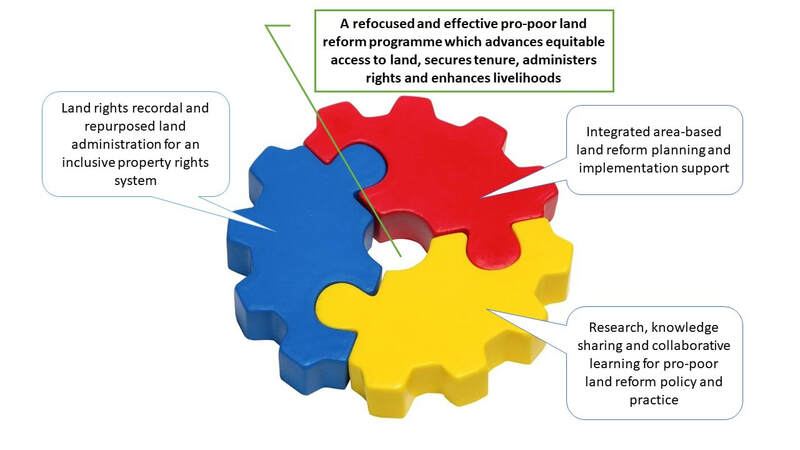 A pro-poor land reform programme implemented across the rural and urban landscape, backed by policy, laws, effective institutions and repurposed land administration to advance equitable access to land, tenure and livelihood security within an integrated property rights system. The expropriation debate diverts from examining the causes of land reform failure. There is no coherent pro-poor land reform policy. There are inadequate budgets and institutional capacity to implement land reform. There has been increasingly ad hoc land reform planning and implementation resulting in poor returns on public expenditure. Land administration has collapsed. The land rights of the poor remain off-register and vulnerable to capture. Mobilise support for a popular White Paper/Land Reform Framework Act process to formulate effective 21st century land policy and law which works for the many - not the few. Initiate district based learning laboratories and inclusive pilots to rethink and test models, promote dialogue and learning. An expanded and dynamic knowledge base of reliable information disseminated through knowledgebase.land. Submissions and policy briefs advocating pro-poor rural and urban land reform. Conceptualisation of improved institutional models for area-based land reform implementation. Documented pilot case studies and linked learning programmes. A research and practice tested framework to advocate for an inclusive property rights and repurposed land administration system. It is widely recognised that land administration systems in South Africa have collapsed. Currently the land rights of some 60% of South Africans remain off register. Work Area #1 focuses on the design and piloting of land recordal and land administration systems which can be progressively rolled out across the land reform landscape. We seek to influence the design and development of a repurposed land administration system as the foundation for an inclusive property rights system which recognises and legally secures the rights of all. It seeks to contribute to the design of systems and spatial data infrastructure for the transparent administration of land rights. This work area builds on the recommendations of the High Level Panel which proposed a Land Records Act and an affordable land administration system based on the recognition of a continuum of land rights to provide secure tenure for all. Land reform planning and implementation support remains fragmented and ad hoc. In work area #2 Phuhlisani seeks support to design and test integrated area-based land reform planning and implementation support systems. We plan to focus our work on two local municipalities. This work area will draw on relationships developed with communities, farm dwellers and labour unions, civil society organisations, organised agriculture, commodity associations as well as local, provincial and national government officials. It seeks to develop a collaborative planning and implementation support approach and document alternative institutional models which draws on our experience of facilitating social dialogue platforms. Our research and knowledge sharing programme (Work area #3) will closely document the planning approach, and examine cost, capacity and feasibility implications. The output will be an integrated planning and support case study which can inform the development and scaling up of new institutional models. This will provide the basis for a linked training and learning programmes for state and non state actors. This closely intersects with Work Area #1 which focuses on land rights recordal and land administration. Phuhlisani NPC has a dedicated focus on applied research, case study documentation and knowledge sharing which are the core of Work Area #3. ​We are working to design, build and maintain a comprehensive website knowledgebase.land (KB.L). Our objective is to incrementally grow the site to become the premier resource for reliable research and information on all aspects of rural and urban land in South Africa. Work Area #3 draws on the other two work streams to distil key lessons and advance collaborative learning for improved pro-poor land reform policy and practice.